Relieved to get of this road we turned left on the Marysville turnoff and then a quick right to take the road to Warburton. Last time we rode this road we had previously stayed at Narbethong caravan park and so we had relatively fresh legs, but we had previously decided to skip Narbethong and go straight to the top and we were going to bush camp at the top but decided that there was forecasted showers late this afternoon and night and since the last 6km of the up and first 8km of the down hill is gravel we decided that it would be to hard if the road was wet so we decided to continue down to Warburton adding a further 16km to our journey. Probably the first 2km of this climb is the steepest and then you just gently climb. We did stop for a break and a bite to eat as judging by the speeds we were going we weren’t going to get there for afternoon tea. Now 21km is a long climb despite the gradient. I suppose you are wondering why we are sitting on the road – this is a single lane road all the way up and very little traffic on this road if any (all up we had 2 over take us and 2 pass by on their way down – so that is 4 cars in total). We came around the corner and I didn’t see it ahead until Neil said ‘stop’ so I just stopped and then I saw it and was about to ask if it is alive and then it moved. I sort of wasn’t expecting to see one today as it is cool, if anything I was looking out for them all day yesterday and we saw none! After a few kms of the gravel the wrists, neck, shoulders and back are starting to ache from trying to keep the heavy bikes under control while going along and through the gravel – the only reason why I put up with this is because this has got to be the most scenic and best hill I have come across in cycling Australia! At last we reach the top – absolutely exhausted! As much as we thought the 21km winding climb up was tough the down hill to Warburton from here is incredibly tough on the body! You have 8km of gravel (more gravelly than when you come up) so you are bouncing along and down this is then met with the road that comes down Mt Donna Buang and from here it is 7.5km of sheer steepness – I am sure I don’t have anymore brake pads left. The decent form Mt Donna Buang is sealed but very winding and in the end at the bottom of the hill when you go to release the brakes completely it is like the wrists and fingers have seized up completely it was very painful to release the brakes! 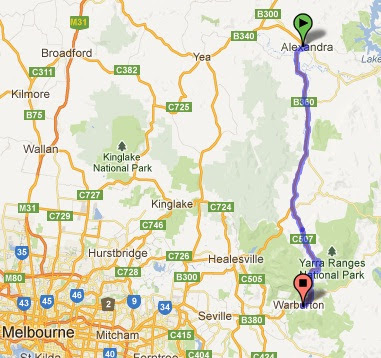 Tomorrow we take the rail trail home … again! I have lost count as to how many times we have ridden that rail trail!